Have you prepared for the holiday season yet? If not, it is time! Lately, I have gotten a lot of requests for great items for stocking stuffers. I adore all body lotions, and never buy them for myself! Check out these awesome retail products by Cuccio! 4 oz. Butter Blends: Milk & Honey, Pomegranate & Fig, and Vanilla Bean & Sugar. 4 oz. 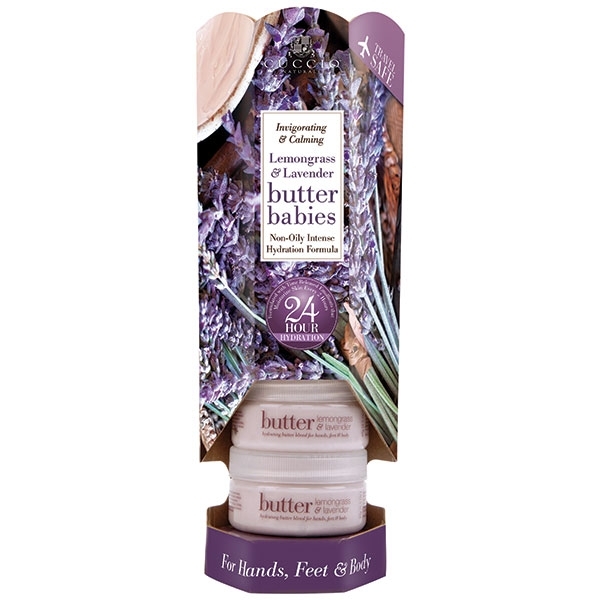 Butter Blends: Lavender & Chamomile, Coconut & White Ginger, and White Limetta & Aloe Vera. This ultra-rich, non-oily 24-hour hydration with time-released emollients is simply wonderful! Looking for more retail ideas? Just ask us! We are happy to help! Anyone want to hear some happy news? Too bad, I am going to tell you anyway! I became an auntie again...my niece was born on Friday! Since I have babies on the brain, I wanted to point out one of my favorite retail products for you to offer your clients in your spa or salon: Cuccio Butter Babies! Cuccio is known for high-quality, moisturizing, deliciously-scented products, and Butter Babies don't disappoint! Much like real babies, they smell delicious, and are thick and creamy, making application a breeze! So why are they called "Butter Babies"? Simple! They are Cuccio's amazing body butters, in cute little travel sized "Baby" containers! Available in a multitude of scents, these cute retail displays will have your clients grabbing these to go every time they check out! Which is your favorite scent?